(CNN) -- Dream big and give back, Michelle Obama told the first graduating class of University of California, Merced on Saturday in her first commencement speech as first lady. 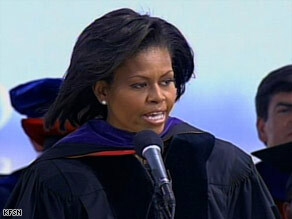 Michelle Obama tells graduates they are blessed and in exchange must give something back. "Remember that you are blessed -- remember that in exchange for those blessings you must give something back," Obama told the sprawling, cheering crowd at the university. "You must reach back and pull someone up. You must bend down and let someone else stand on your shoulders so that they can see a brighter future." The trip to the state university system's newest and smallest campus was Obama's first trip to California since her husband took office. The fledgling school, which opened in 2005 and has a 2,700-member student body, worked hard to get the first lady's attention, writing letters to Obama, her office, her friends and family, according to the White House. They even started a "Dear Michelle" Facebook campaign that sent 900 Valentine's Day cards to her. The first lady accepted the invitation in March, tapping University of California, Merced as her only stop on this year's collegiate commencement circuit. Obama has also agreed to speak at the Washington Math and Science Technical High School on June 3. "A few people may be wondering why did I choose the University of California, Merced to deliver my first commencement speech as first lady," said Obama, in full academic dress. "Let me tell you something, the answer is simple: You inspired me." "My office received thousands of letters and, of course, Valentine's cards from students -- each and every one of them so filled with hope and enthusiasm," she said. "Every schoolkid in the entire county, I understand, sent a postcard to the UC board of regents in order to convince them to select Merced," Obama said. "I just love the fact that some of the graduates sitting in this audience today participating were involved in that campaign as well and they used the same strategy to get me here -- that is amazing." After her speech, Obama was given one of five chancellor's medals for exceptional achievement awarded Saturday. It is the university's highest honor.